Wudang Quan originated from the Taoist holy land of Wudang Mountain and is referred to as the ancestor of Internal Boxing school of the traditional Chinese marial arts. 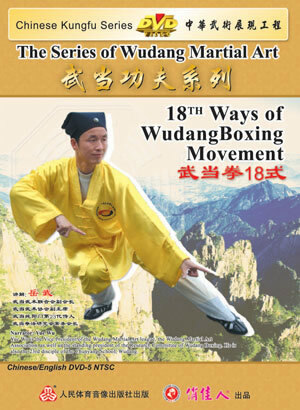 In order to promote Wudang martial arts and to recur its aspect, master Yue Wu with the support of the government of Shiyan City and under the leadership of the Shiyan City Wushu Association, composed this 18-form Wudang Quan routine by integrating the essence of the movements from more than ten different traditional Wudang routines, including Xiaoyao Quan, Chuanyang Quan, Taiyi Wuxing Quan, Natural School of Wudang, Wudang Esoteric Tai Chi, Wise Beat, Eight-step Dragon Heart Palm, Taihe Quan, Zhaobao Taichi, etc. This routine combines regimen, combat and performance as a whole with movments rarely seen in other popular internal boxing routines in the society.